GBPUSD failed its attempts to breakout of 1.3228 resistance and pulled back to 1.3110 area, suggesting that the pair remains in the short term downtrend from 1.3337 and deeper decline towards the major support trend line on the daily chart would likely be seen in the coming days. Near term support is at 1.3087, below this level could signal resumption of the downtrend. 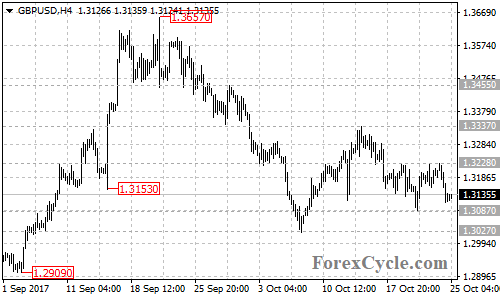 On the upside, a breakout of 1.3228 level could bring price back to test 1.3337 resistance, above this level could trigger further upside movement towards 1.3455. ForexCycle.com provides free forex analysis, forex signals and forex trading strategies. CFD Spy is a informational website based mostly around online trading, with a current focus towards CFDs, Forex, Stocks and Spread Betting. We aim to list and compare the top online trading brokers and brokerages available. Disclaimer: CFD Spy is meant for informational purposes only, whilst we do our best to make sure cfdspy.com is up to date and accurate at all times, we do not make any claims that the content or opinions found within are infact accurate or up to date. Any websites, company/s or services referred to/linked to throughtout CFDspy.com are not directly affiliated with us, and their inclusion within CFD Spy is not meant to/ and does not convey our sponsorship or support of such company/s or website/s, furthermore, we are not responsible or liable for their availability, content, or delivery of services found therein. Stock's, Futures , Forex &/or CFD Trading involves substantial risk of loss and is not suitable for all investors. And as a side note, one would be wise to consider that so, for any kind of trading, and you should be fully aware of the risks involved before proceeding with any form.